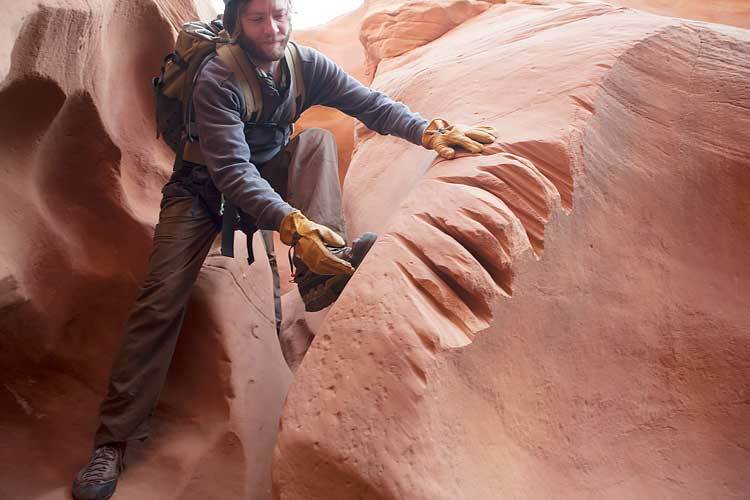 In many canyons natural anchors are the best way to preserve the experience for the canyoneering resource. But what happens when the use of a specific canyon begins to exceed wilderness management policies that were designed to protect it? When damage due to increased used comes to the attention of a land management agency like the BLM, the most common options are – to restrict use, or to improve the route in a way that makes it more resistant to increased human traffic, or a combination of both. East fork of Leprechaun Canyon – the unsightly rope grooves shown in this photo are the primarily the result of the location of the canyoneering rappel anchor. Increased use also played a part in the damage with the rope grooves getting deeper every time a group descended the canyon and pulled there rope through the anchor point. It is important for both canyoneers and land agencies to understand that in many cases damage like this is completely avoidable. There are several different ways to accomplish this and there is no doubt that conscientious canyoneering parties are already making these adjustments. Every canyon is different. Every rappel is different. In some cases there is no solution for reducing rope damage caused a canyoneering anchor. However, in most cases, there are a variety of solutions that can be applied to minimize or completely eliminate rope damage. Anchor placement selection is the best and most powerful solution to this problem. And yes in some cases artificial anchors ARE be the best choice for minimizing canyoneering rope damage. The reason that artificial anchors are so effective is because they can be placed in more locations and purposefully much higher points which significantly reduces the angle that the rope runs over the rock. In contrast natural anchors are most often placed at ground level which commonly results in the rope making a 90 degree angle/bend over the rock. Natural anchors can also be moved and created in strategic locations to minimize damage. Extending anchor points is another solution but has the disadvantages of more difficult rappel starts and more anchor material accumulating in canyons. Fiddlesticks – these have become increasingly popular for minimizing rope damage but also come with increased risk and must be used correctly.